 Check engine light on? 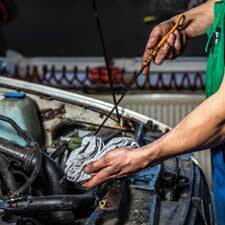 Is it time to give your vehicle an oil change? At Country Clug Garage we have been trusted by the community of Wallingford, CT for over 40 years. We believe in fairness and quality of service. Our experienced technicians never compromise on quality when it comes to giving you the best possible service. Most modern vehicles are able to go longer before their next oil change. Typically an average driver with a modern vehicle should have their oil changed every 3000 miles, over every 3 months, whichever comes first. You may have heard that synthetic or performance oil should be changed every 15,000 miles or once per year, whichever comes first. The oil may last that long, but the filter won’t. We recommend changing the oil every 3 months for best performance and a longer lasting engine. Having your oil changed gives your mechanic an opportunity to inspect your vehicle 2-4 times per year, instead of the usual 1-2, which can’t be a bad thing. Oil changes are often combined with other services such as wheel alignment and routine maintenance. Each car is different and has differnet requirement when it comes to oil changes. If you are unsure about how often you should change your engines oil, refer to your manufacturers handbook. Call to arrange an oil change today! Has it been a while since your last oil change? Is your engine performing badly? Let us be your trusted choice for your next oil change service.